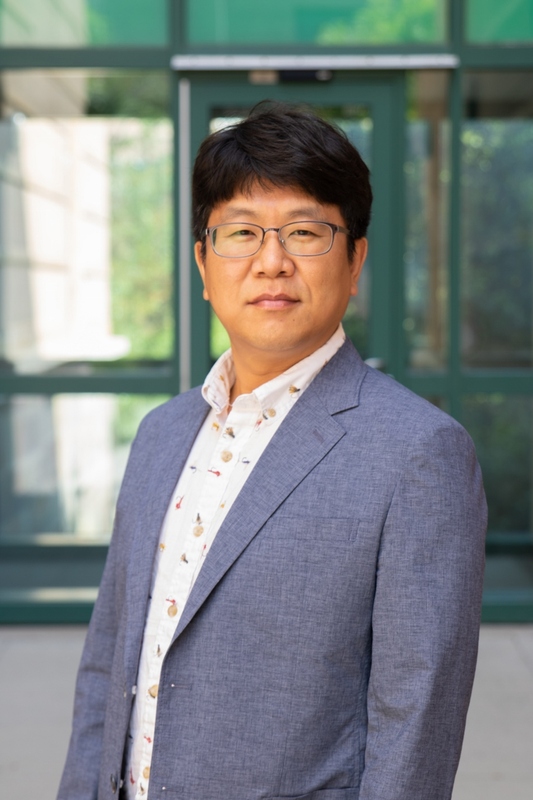 The Eom lab is interested in discovering the cellular and molecular mechanisms of long-range intercellularcommunication mediated by specialized cellular projections (non-conventional protrusions) including a novel signaling projection called airinemes. Mechanisms underlying morphogenesis and pattern formation are one of the most critical questions in developmental biology. 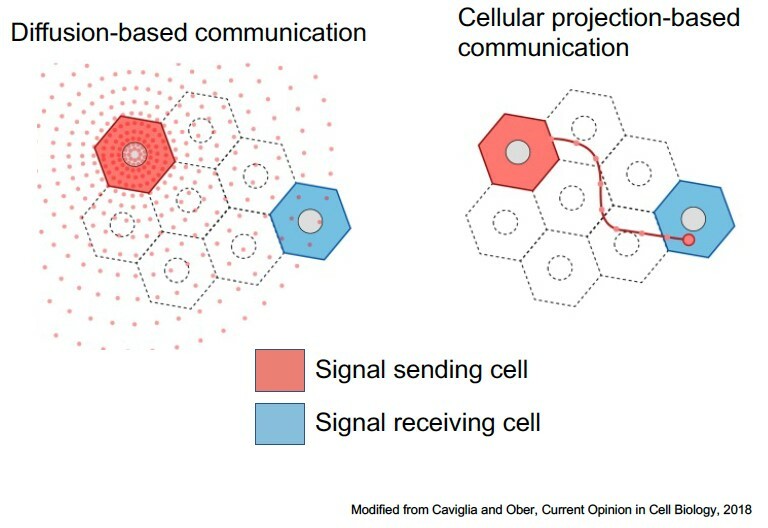 Cells acquire positional identities by communicating with cells of signaling center in a distance and interpret this information to form shape and pattern. 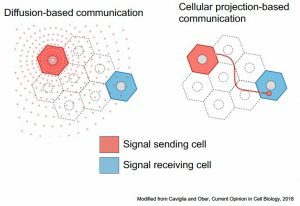 Besides previously established morphogen diffusion mediated signaling, recently, the importance of other types of long-distance signaling modality that utilize direct contact through cellular projections has been emerging. These cellular projections are filopodia-like but considerably longer and play crucial signaling roles in various contexts. Nevertheless, the fundamental questions underlying the mechanisms of their regulation, delivery of signaling molecules, and targeting remain largely unknown. We discovered a novel type of cellular projection-mediated signaling modality utilizing a distinct cellular projection, which we named “airinemes”. Airinemes extend up to ~250μm and last for seconds to hours depending on their target specificity. One striking difference between airinemes and other cellular projections is that airinemes have membrane-bound vesicles at their tips (Figure 1, arrowheads; referred as airineme vesicles), which carry Delta ligands. 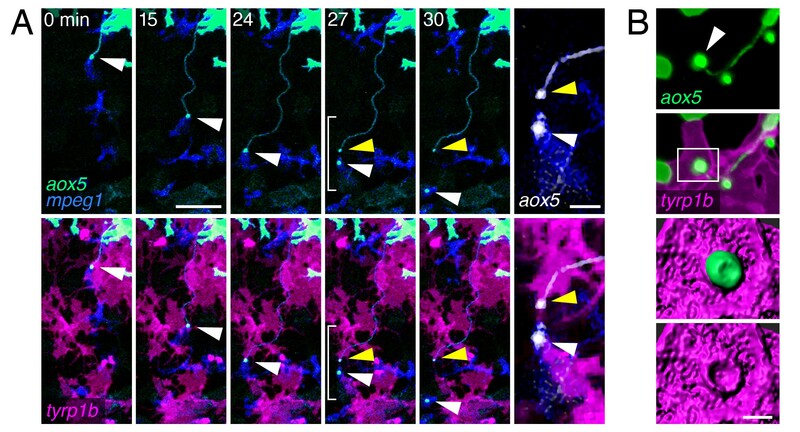 Airinemes are extended from xanthoblasts, undifferentiated yellow pigment cells, which play a critical role in stripe pigment pattern formation in zebrafish. We found that airinemes are indispensable for post-embryonic stripe formation through airineme dependent delivery of Delta ligand from xanthoblasts to target melanophores (another type of pigment cells form black strips). It has long been suggested that the long distance signaling between melanophores and xanthophore lineages are mediated by diffusible factors, predicted by the reaction-diffusion model. Nevertheless, we propose that it is mediated by direct contact-mediated signaling through airinemes. Figure 1. Adult zebrafish with black stripes and light interstripes (upper). Time-lapse frames show xanthoblast (aox5+, green) extend airineme and the vesicle (arrowhead) is associated with a macrophage (mpeg1+, blue) (lower). Additionally, we found a compelling answer to the question of how airinemes are guided and targeted. Strikingly, we discovered that macrophages pick up the airineme vesicles from the surface of xanthoblasts, pull, drag and deposit them onto target melanophores where vesicles will later be phagocytosed by other macrophages. Macrophages are well known innate immune cells that clear dead cells and pathogens. 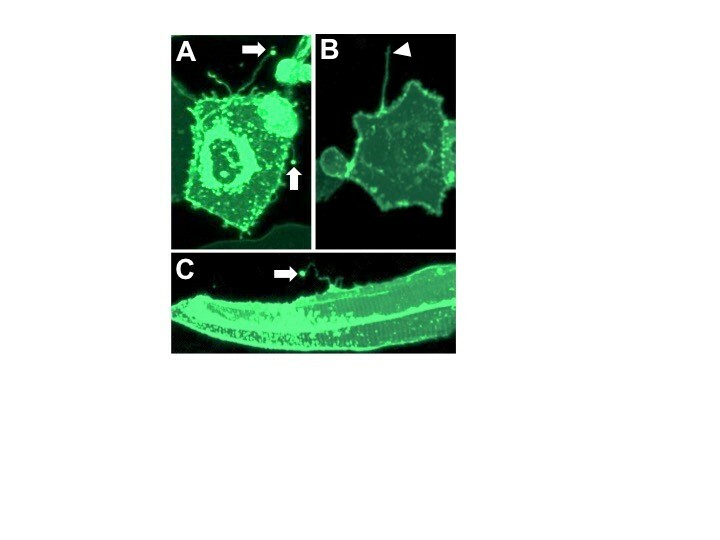 Our findings show that macrophages are a key player in long-range signaling by initiating the delivery of airineme vesicles as well as terminating them by phagocytosis during adult pigment pattern formation in zebrafish. Intriguingly, we have observed airineme-like projections from several non-pigment cell types, and this leads us to hypothesize that airineme/macrophage-mediated signaling could be used more commonly in nature. Figure 2. Various cell types that extend airineme-like projections. Eom DS, Parichy DM. (2017) A macrophage relay for long distance signaling during post-embryonic tissue remodeling. Science 355(6331):1317-1320. Eom DS, Bain EJ, Patterson LB, Grout M, Parichy DM. (2015) Long-distance communication by specialized cellular projections during pigment pattern development and evolution. eLife 10.7554/eLife.12401. McMenamin SK, Bain EJ, McCann AE, Patterson LB, Eom DS, Waller ZP, Hamill JC, Kuhlman JA, Eisen JS, Parichy DM. (2014) Thyroid hormone-dependent adult pigment cell lineage and pattern in zebrafish. Science 345(6202):1358-1361. Eom DS, Amarnath S, Agarwala S. (2013) Apicobasal polarity and neural tube closure. Dev Growth Differ. 55(1):164-172. 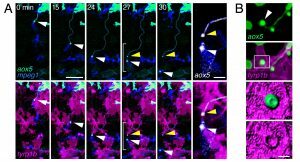 Eom DS, Smita A, Fogel LJ, Agarwala S. (2011) Bone morphogenetic proteins regulate neural tube closure by interacting with the apicobasal polarity pathway. Development (138) 3179-3188.